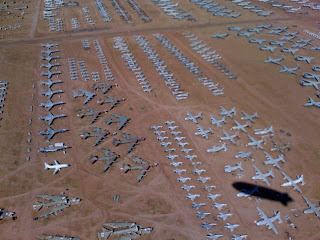 Old planes as far as the eye could see. it. Maybe I'll spot it later when I review the pics. By zeppelin is probably the best way to see that place that I can think of. Most of the birds in this shot are pretty old, but the row on the left side are B-1 Lancers, and those aren't that old! They are probably supplying parts to the B-1's that are still flying. Do you have a larger version of that image? There's something very cool about the shadow of the revived Zeppelin falling across a heavier-than-air boneyard.